Could any Moroccan beverage be more iconic than syrupy sweet Moroccan mint tea? This famous and beloved drink is made by steeping green tea with a generous handful of spearmint leaves; sometimes other types of mint or herbs may be added. 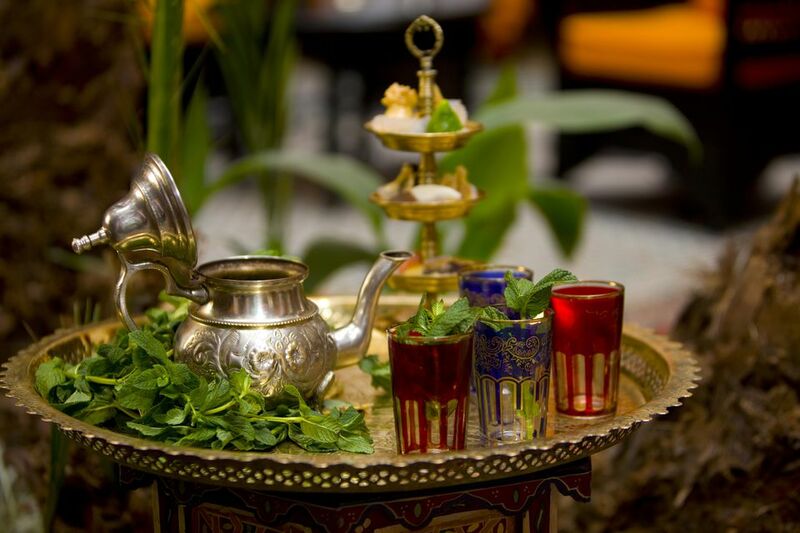 Many families serve tea more than once a day, and Moroccan hospitality dictates that one must always offer mint tea to both drop-ins and expected guests. Moroccan teapots vary in size, but a small pot typically holds about a half liter (six small tea glasses), while a larger pot holds approximately a liter (12 glasses). The measures below are for a small pot of tea and are approximates since tea leaves vary in quality and strength. A variety—not a brand—of green tea called Chinese gunpowder is the preferred tea to use. Bring a liter or more of water to a full boil. Swirl a little of the boiling water—about 1/4 cup—in your teapot to rinse it. Discard the water. Add the gunpowder green tea to the pot, then pour a few tablespoons of boiling water over the leaves. Allow the leaves to soak briefly, then swirl the pot to rinse the leaves and discard the water. Add the mint leaves and the sugar, and fill the pot with 1/2 liter (about 2 cups) boiling water. Leave the tea to steep for five minutes or longer. Gently stir the tea and serve. Moroccan teapots have built-in strainers; if using another type of pot, you'll need to use a small strainer when pouring the tea. If the room is cold and your teapot is stovetop safe, the tea can be steeped over medium-low heat to help hold the tea warm longer. Heat it just until it reaches a simmer. Watch carefully; if the tea reaches a full boil, the top can foam excessively and spill over, making a mess. Some Moroccans prefer to add the mint leaves after the tea has steeped. Instead of stirring, the sugar may be mixed into the tea by pouring tea into a glass, then returning the tea to the pot. It is repeated several times. Moroccan tea is traditionally poured from a forearm's height over the glass; this allows for the creation of a desirable foamy "head" on the glass of tea. A small sprig of mint can be added to each glass for more intense mint flavor. Do adjust sugar to your personal taste. The recipe reflects the fact that most Moroccans like their tea exceptionally sweet. It is changing a bit due to dietary restrictions and increased awareness of health issues related to high sugar intake, so it is becomingly common to see two teapots on a serving tray – one traditionally sweet, the other lightly sweetened or not at all. Guests choose from either pot or request a glass comprising a mix of the two. The recipe's directions simplify the steeping process; to make the tea more traditionally, see the photo tutorial how to make Moroccan tea. Although fresh mint leaves are preferred in Morocco, you can substitute dried spearmint leaves (about a tablespoon) when the fresh mint is unavailable.